Candlesticks are a beautiful and affordable accessory for decorating your home. For collectors, you can never have too many candlesticks; you can use them to decorate desks, tables, mantles, and dressers - just about any flat surface in your home. Unusual candlesticks add character to a room. For instance, this candlestick made by Old Poland's artisans and potters adds a rustic touch. 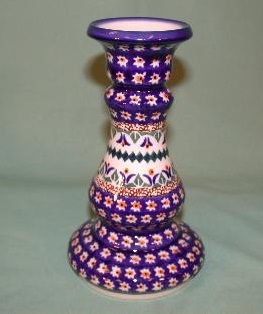 A candlestick in a unique colors such as this likewise adds spice to a room. Try to color coordinate candlesticks with the rest of the décor. Measures 6 1/2 " tall. Lead and cadmium free.